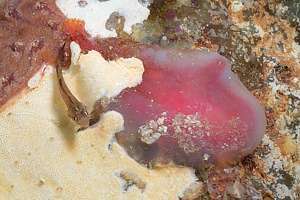 This page details the common seasquirts found on the New Zealand intertidal rocky shore. 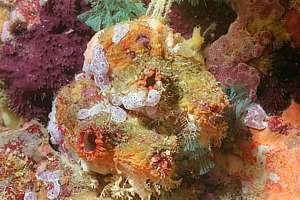 Sea squirts are found as mats, blobs or squirts. 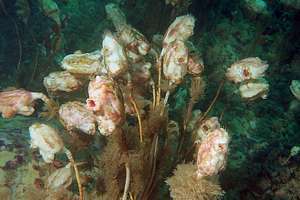 They are often very difficult to identify, and can easily be confused with sponges. Note! for best printed results, read tips for printing first. For suggestions and comments, please e-mail the author. 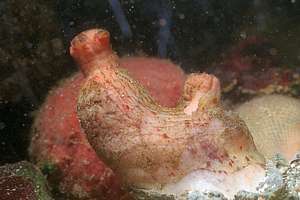 Ascidians are seasquirts, ancient organisms and belong to the Phylum Chordata rather than lower order phyla because their embryos show what looks like a spinal cord. Seasquirts can be individual, attached to the rock, or free-floating in the ocean. They can also be mat-forming, but still individual. Seasquirts can also be communal, each having its own inlet while sharing a communal outlet. These can be individual or mat-forming. 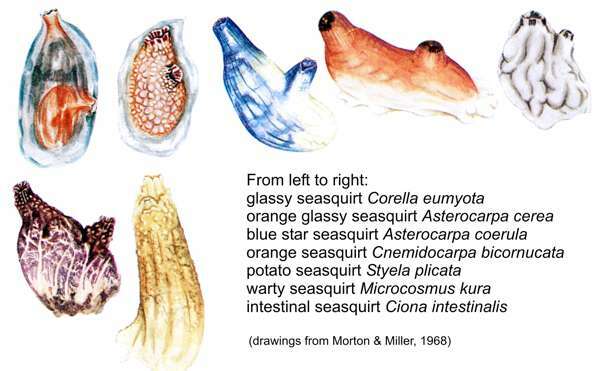 Seasquirts can be large, the size of a fist or very small, too small to be distinguished without magnification. Seasquirt mats are easily confused with mats of encrusting sponges. Some seasquirts can grow old (dozens of years) whereas others live for only a single season. 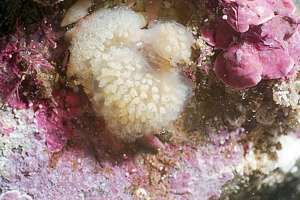 The seas around New Zealand have many seasquirt species. Most seasquirts do not like to become exposed during low tide, and one finds them underneath stones at the low tide margin. A seasquirt breathes water in through its inlet siphon on top, and breathes out through its outlet siphon lower down. Inside the animal, the water passes through a fine net which strains particles out. Edible particles are transported towards the mouth by thoudands of vibrating hairs (cilia), whereas inedible particles are 'coughed' out through the inlet. Wastes and eggs are passed through the outlet. 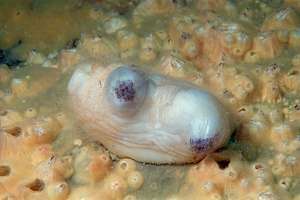 Seasquirts can be prolific breeders, producing large numbers of eggs. 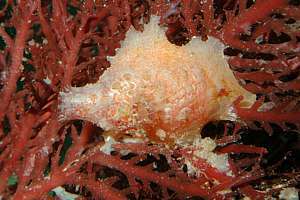 Some seasquirts can also reproduce by 'budding' off new individuals as the colony spreads. f019028: the blue star seasquirt (Asterocarpa coerula) is one of the most comon seasquirts found under stones. It can be wite to blue. Its blue mouth is star shaped. The barnacles around it are flat barnacles. f018931: the glassy seasquirt (Corella eumyota) (3cm) is easily recognised. Its skin is not slimy but feels firm. The brown and white patches are bryozoan mats, and the red star is a young oar star. f052217: orange seasquirt (Cnemidocarpa bicornucata) . 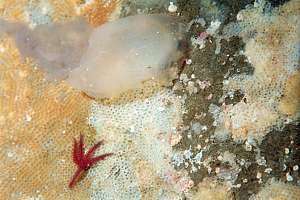 0704120: the waxy seasquirt (Asterocarpa cerea) is small, transparent, pear-shaped and cream or brownish in colour, with a pinkish tinge. Its two siphons are lined in brown/wite. Inhalant siphon on lef, exhaland in middle, showing brown/white lines. f052214: the warty seasquirt (Cnemidocarpa nisiotus) although orange-brown in colour, is well hidden as it allows itself to be grown over by other organisms, like algae and anemones. Its siphons are pink/white. The above seasquirt lives in an aquarium. f052403: two warty seasquirts (Microcosmos kura) attached to a wall on the Poor Knights Islands. 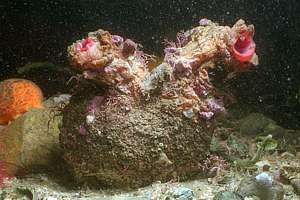 There is a purple crust sponge in the background and several patches of matting colonial seasquirts. f052218: the potato seasquirt (Styela plicata) is a white solitary seasquirt with deep irregular grooves like pleats and black/white edged siphons at one end. 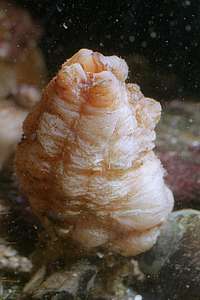 the intestinal seasquirt (Ciona intestinalis) (6cm) has a ribbed body, white to brown in coulour with two yellow-collared siphons at one end. It was introduced from the North Atlantic and North Sea. the clubbed seasquirt (Styela clava) thrives in highly degraded water and is probably also an introduced species. 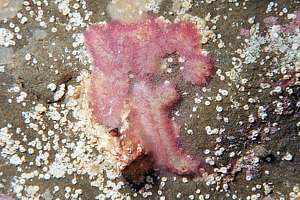 f051631: a glassy dark pink seasquirt (?) being invaded by seasquirt mats of three kinds. f027021: the stalked sea tulip (Boltenia pachydermatina) (previously Pyura d.)stands on a long stalk. It can be pink-red or white in colour. It is often found just beneath the lower littoral fringe. South Island. f050603: colonial seasquirts like this slimy blob, cannot easily be identified. f018918: a slimy plaque of paired colonial seasquirts. 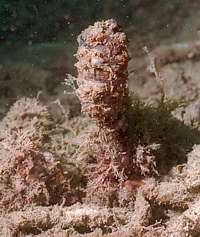 f050806: the clubbed seasquirt (Styela clava) thrives in highly degraded environments as shown here. At times bunches of glassy seasquirts or salps can become washed up on the shore from the open ocean. These are pelagic seasquirts that propel themselves by the exhaust currents from their siphons.